Telegraph Avenue Telegraph Avenue focuses on a group of Oakland, California residents who are juggling various crises. The current issue on Telegraph is the pending opening of a mega-sized record store. The store, to be called Dogpile, threatens the existing Brokeland, a local and beloved down-at-the-heels purveyor of vintage vinyl. It takes a while to figure out where this novel is heading because the author keeps introducing quirky characters with oddball, but mostly endearing side stories. The owners of Brokeland are best friends. Archy Stallings is black; Nat Jaffe is a Jewish white guy. Their wives, Gwen and Aviva, also good friends, run Birth Partners, a successful midwifery business that, due to an almost botched, but ultimately safe delivery threatens their business because the hospital wants to revoke their admitting privileges. Brokeland’s hip hop era owners, the store’s location, its retro selections and the host of characters attracted to their 1970s inventory allows Michael Chabon to run with a jazzy, jive homeboy vernacular. The book’s language is playful and it often takes big leaps; the names Dogpile and Brokeland are two examples. Beyond music lingo, characters speak in 1970s blaxploitation-movie-talk, and techno-fantasy jargon. The latter, if you’re not fourteen years-old, or a devotee of Parallel Universes, can be difficult to follow. Chabon’s sentences also run long; thirty to forty words is common; one goes on for twelve pages. In places, the plot becomes far-fetched and jumbled, but ultimately, Telegraph Avenue won me over. 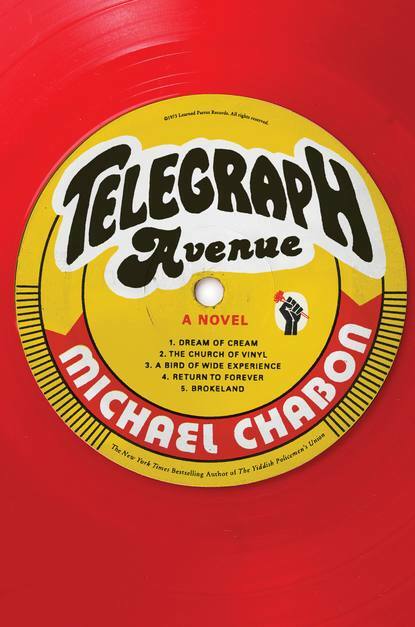 I was impressed by the characters’ humanity, Chabon’s edgy language and his creative handling of the David and Goliath theme: small business vs. large corporate interests. Chabon speaks for the 99% and for freewheeling communities like Oakland and Harlem that are slowing being transformed by big money and special interests. .